Eddie, the Lad, was out from the UK where he currently lives, so Dad and Lad, the ‘A Team’, of course set up for a bout of fly-fishing in the Taupo region of Central North Island, NZ. We spent one day of our time together on Lake Otamangakau, up on the volcanic plateau above Taupo. Otamangakau’s trout are rightly renowned for the strength and endurance they exhibit between hook-up and net. That is if you can get the fish to the net. Many become un-hooked fish, departing at flank speed followed by a stream of very naughty language indeed. 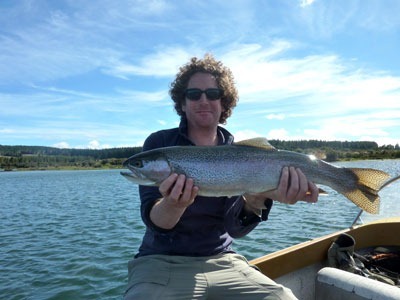 The lake also has a deserved reputation for being very reluctant to share its trout with visiting anglers. Most times the fishing verges on hard, often very hard. But put in the ‘hard yards’ as they say, and the rewards are very satisfying. 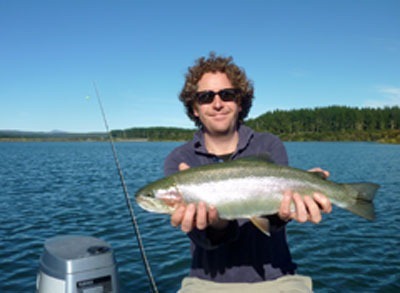 We fished with Contact Guide Graham Dean, one of the most knowledgeable Guides on Lake Otamangakau’s intricacies. I have fished with Graham before and know when he describes the state of the fishing, he does not mince words, This day the word was that the fishing was officially ‘hard’, but we left satisfied – a number of good fish always leave a bit of a warm glow. Eddie shows off a typical Lake O trout, well-rounded and packed with muscle. Most anglers when they first hook-up on on one of these fish will call it for being much bigger. 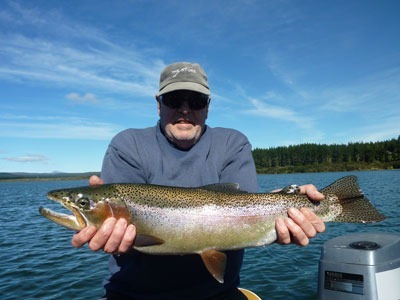 Dad, a.k.a Bish, in incognito mode, with a very nice trout.